This deck is the Bergamasche. 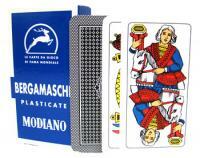 It is from the northern Italian regional style of Italian playing cards (see below). The Size of the Deck is 3 1/4" x 2". Although played throughout Italy, It is most commonly played in the Lombardy region. Deck of Bergamasche Italian Regional Playing Cards This deck is the Bergamasche. It is from the northern Italian regional style of Italian playing cards (see below). The Size of the Deck is 3 1/4" x 2". Although played throughout Italy, It is most commonly played in the Lombardy region.